My early childhood was spent at Thornleigh and my later teen years at Normanhurst (1945-late 1960’s). 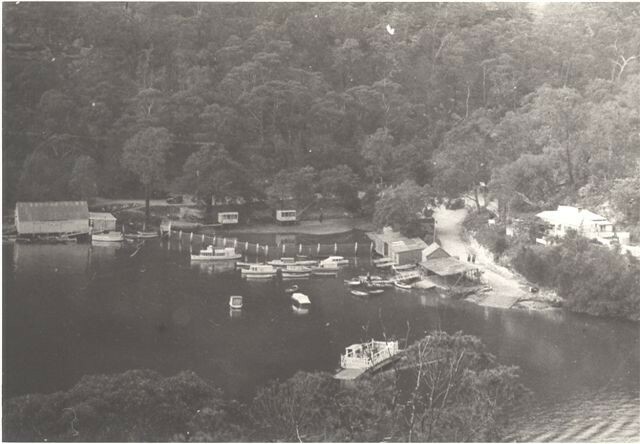 Neither place had suitable swimming spots near to our house so during the Summer my father would come home from work and pack us three children (and mum too) into the car and off we would go to Berowra Waters. The pool was beside the ferry and although I think that the shoreline may have changed since those days, I remember it being almost triangular in shape with a net across the end, I never looked to see if it was shark proof though. My dad was a hard worker (read work-a-holic) and we seldom went to the beach or on holidays so we considered this to be a treat on a hot day. We must have gone late in the day unless it was occasionally a weekend as I do not remember any other people ever being there with us. I remember rides across on the ferry and very occasionally an ice-cream from the shop. I think there may have been a shop just near the ferry and another up higher above the road on the left. By the time I was a Mum myself the spot became more of a picnic ground and if the netted pool was still there it must have been surrounded by the business that was conducted on the eastern side of the river.